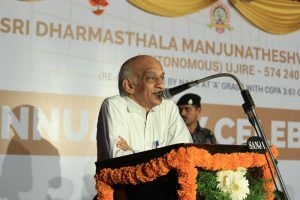 “The current generation needs to comprehend the importance of applying their academic knowledge to make practical commitments that can ensure world welfare”, said the former Chairman of ISRO, A.S.Kiran Kumar. He was addressing the gathering as the Chief Guest at the annual day ceremony of SDM College Ujire on 20 March. “India ranks fifth on the list of countries with excellent scientific and technological achievements. This was only possible owing to the perseverance of the scientists of India. Despite a lack of financial resources, India has pioneered the field of scientific achievement and has become a model for the same. In order to uphold the same identity and further enhance it, the youth of India needs to creatively and experimentally broaden their intellectual horizons”, he added. “In the field of space study and research, ISRO has proudly set up models and been a teacher to most advanced institutions in the world. ISRO satellites have been instrumental in predicting hurricanes and extreme weather conditions weeks in advance, preventing innumerable casualties. Information related to availability of fish within the ocean saved the fisheries department a sum of 15 thousand crores. ISRO also holds the fame for having discovered water on the surface of the moon,” he continued. Rajyotsava Awardee D Surendra Kumar was felicitated at the occasion. Dr. Lakshmi Narayana, Dr. Savitha Kumari, Dr. Priya Kumari, Dr. Purandara, Dr. Rakesh TS, Dr. Satish Ganapa Nayak, who were recently awarded PhDs were also felicitated alongside other academic, sports and cultural achievers. 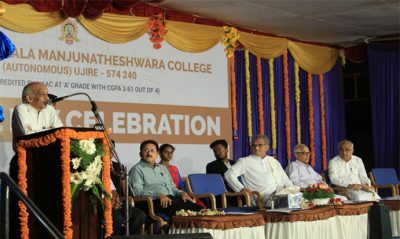 The Principal of the college Prof. TN Keshava welcomed the gathering. Dean Dr. Jayakumar Shetty presented the annual report. Dr. B A Kumara Hegde, Dr. Shreedhara Bhat and Shruti mastered the ceremony. Dr. B P Sampath Kumar delivered the vote of thanks.